I’ve been spending a lot of time with the Queen of Pentacles lately. Well, I have a tendency to get very cerebral and I start ignoring or forgetting about my physical needs. I think in the modern world where everyone is moving so fast and is expected to operate at peek efficiency all the time, its easy to lose track of your body and what it requires. So I decided that to help generate more mindfulness about caring for my body, I would seek out the tarot card that best represented that energy and spend some time meditating on it. 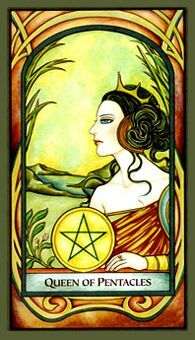 The Queen of Pentacles fits the bill beautifully. As a Queen she is nurturing and as a Pentacle she is all about the physical, the body. The Queen of Pentacles from the Steampunk Tarot by Aly Fell and Barbara Moore (pictured top) CLEARLY takes very good care of herself and values her physical health. This Queen understands the mind-body connection. She knows that by caring for her body, she is also caring for her mind and her spirit. When she’s taking time to nurture her body, she’s not thinking about how long its taking or what else she could be doing, she is reveling in the opportunity to provide for the vessel she has the honor of inhabiting. 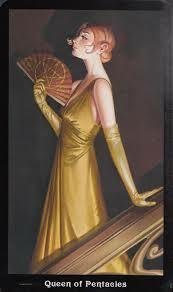 I think that this perspective is the key to understanding the Queen of Pentacles and the lessons she has to impart. The body is not the enemy, it is the vessel of our human experience and should be appreciated and given what it needs to thrive and be strong. Its not an exhaustive list by any means, but its a good start for me. 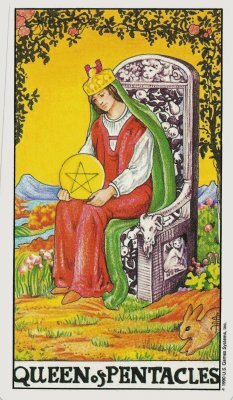 What does the Queen of Pentacles have to say to you about your relationship with your body and its care? I hope you will succeed in your resolutions !